Microsoft Volume License customers will now find the Windows 10 Enterprise (build 1511) downloads (ISO files) are now available on the Microsoft Volume Licensing Center (VLSC) portal (as of November 16, 2015). ** Windows 10 Enterprise, Version 1511 is a Current Branch and includes the latest updates and features. 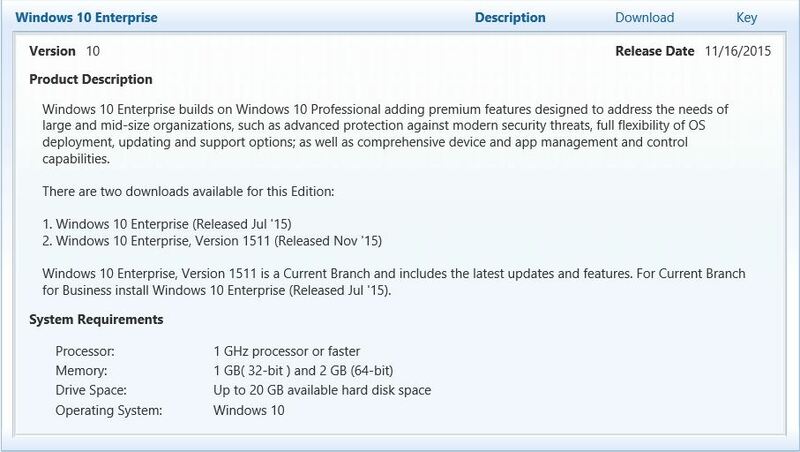 For Current Branch for Business, install Windows 10 Enterprise (Released Jul ’15). This entry was posted in Microsoft, Windows and tagged 32-Bit, 64-Bit, Downloads, ISO, Microsoft, Operating System, OS, Software, VLSC, Volume License, Windows, Windows 10 by harjit. Bookmark the permalink.